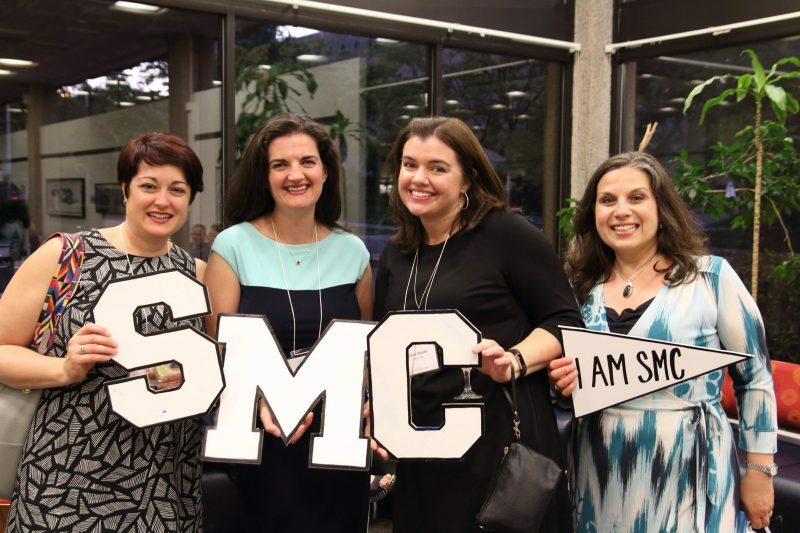 On Friday, June 1, hundreds of alumni and friends of the University of St. Michael’s College came to campus for one of the largest Spring Reunions ever hosted at St. Mike’s. The USMC Advancement and Alumni Affairs teams organized 14 different events scheduled around additional reunion celebrations at the University of Toronto, and in the final count, 675 people attended St. Michael’s special events. This year, honoured classes included those falling on 5-year anniversaries moving back from 2018, and some returning alumni graduated as far back as 1948. 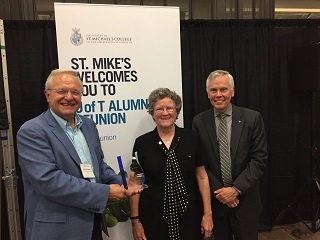 In his remarks at Friday evening’s champagne reception and alumni association AGM, outgoing St. Michael’s President David Mulroney, 7T8 thanked alumni for their continuing loyalty and support. “As we continue to build on the traditions that make St. Mike’s special we are informed and inspired by your memories – of exceptional teachers and our welcoming community within the larger U of T,” he said. Some of the memorabilia on display. These memories gave the weekend its primary theme. 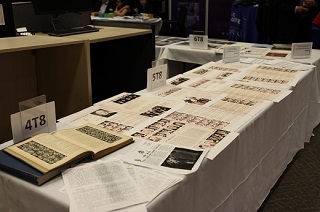 Attendees reminisced and shared stories at each event, and during periods of downtime, many of them browsed a collection of memorabilia displayed in the library. Campus tours reacquainted guests with Elmsley Hall, Sorbara Hall and the Quad, and included a stop at a re-creation of Marshall McLuhan’s office. Book & Media Studies professor Paolo Granata developed the McLuhan office display for Doors Open Toronto the weekend before, and made a number of authentic McLuhan artifacts available for inspection. Professor Granata also delivered one of three St. Michael’s lectures over the weekend. The McLuhan expert offered guests a “Guide to Surviving the Internet Age” on Saturday morning, while during the afternoon, USMC Principal Randy Boyagoda read excerpts from his latest novel as part of a “Stress-Free Degree” session titled “Writers on Writing.” Christianity and Culture professor Stephen Tardif, 0T6 concluded the academic proceedings for the weekend with a Sunday afternoon lecture on Jane Austen’s Pride and Prejudice that centered on the mischievous question of whether Austen actually desired to be married herself. Each professor spoke to a packed audience with standing room only. A memorial gathering for beloved English professor and noted Austen fan Fred Flahiff followed professor Tardif’s presentation. The presentation of the Alway Award. In addition to the lectures, tours and special events that fill up the weekend, Spring Reunion is also the time of year for presenting the Alway Award. Established in 2007, the Alway Award is intended to honour a graduate of St. Michael’s who has demonstrated the highest character and made a significant contribution to society through spiritual, professional and personal excellence. This year’s award went to Dr. Peggy R. Williams, 6T8 in recognition of a remarkable career that includes serving as president of both Lyndon State College in Vermont and Ithaca College in New York. At the latter institution, she was the first woman to serve as president. One other regular St. Michael’s event entered the weekend’s itinerary, as Mass was celebrated twice on campus during the reunion. Professor emeritus Father Dan Donovan, 5T8 presided over a special Mass for the class of 6T8 on Friday morning, and Father Norman Tanck, CSB celebrated the 10:30 a.m. Sunday Mass in St. Basil’s Church in the presence of an overflow crowd of visiting alumni—some of whom had not been to campus or the church since their undergraduate days. Standing room only, overflow crowds, packed audiences—the sheer number of guests to campus gave each event a special air of excitement and interest. The class of 6T8 celebrated the 50th anniversary of their graduation with record numbers of attendees, some of whom traveled from as far away as California and the UK. In their student days, Father Robert Madden, CSB dubbed them “the class with brass.” After raising more than $125,000 to support the Brennan Hall renewal project—nearly twice their original goal for the anniversary milestone—it was easy for all to see the spirit and camaraderie that earned them the title. The class of 5T8 came together to celebrate their own anniversary at a Friday afternoon reception graciously hosted by Ann Marie Sweeney with the support of fellow year reps Frank and Mary Pat Kielty. Cheers went up for the class at the dinner on Saturday. The presence of these alumni on campus was reason enough to celebrate, but their gifts of over $122,000 to the Brennan Hall renovation (a project their class had also chosen to support) provided a second reason for cheering: the investment in the lives and experiences of future St. Michael’s students. Honouring the class of 4T8. The largest ovation at the Saturday dinner, however, was reserved for a small but important group. Four members of the class of 4T8 made the trip to St. Michael’s this year to celebrate the 70th anniversary of their graduation, a truly remarkable milestone and wonderful point of connection with a vaunted era in the history of the College. That history continues, as outgoing President Mulroney said on Friday evening: In a new era at St. Michael’s, “we are informed and inspired by your memories.” This year provided an occasion for many new and joyous memories to be made. Special thanks go out to St. Michael’s staff Leslie Belzak, Melanie Waring-Chapman, Matt Doyle and their student assistants, whose work in organizing and carrying out this year’s Reunion testified in its own way to the spirit and character of the College—a place that will always welcome its alumni home.